Learn how to make your Windows profile as unique as you are with these topics: changing display settings, sharing files, picture passwords, Start and Live Tiles, safety and security. Make your Windows account your very own. Use your favourite photo as a background or colour coordinate! If you're not happy with the themes, you can download more or create your own in Personalisation. 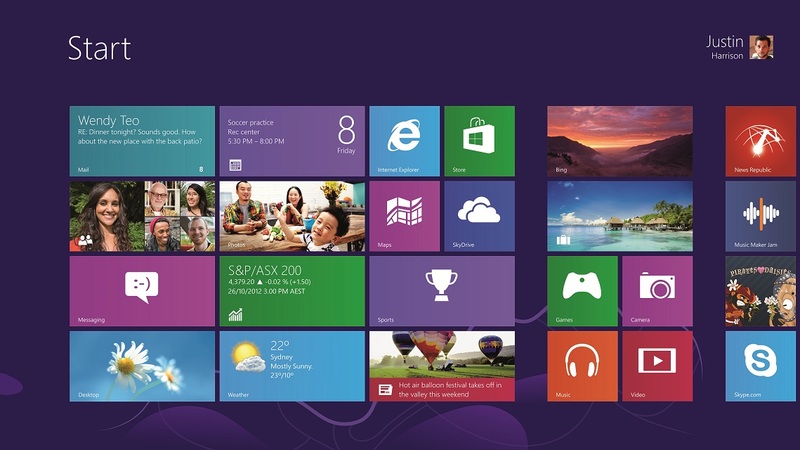 You can really personalise your Windows 8.1 account by using your favourite photograph as a screen saver or by selecting multiple photos to create a slide show. You can always uninstall a screen saver from your PC if you know you'll never use it or just don't like it. Preinstalled Windows screen savers cannot be deleted. One of the best things about the Windows Share charm is that you don't have to stop what you're doing to share files with family and friends. It's great for whether you want to send information to another app or share with your entire social network. A list of all the people, apps and devices you with most regularly and a list of all the apps installed on your PC with sharing capabilities will now be displayed. Tap or click the device, app or person you want to share with and follow the on-screen prompts. Tip! You can also adjust which apps are listed in the Share charm. To do this, go to the Settings charm, select Change PC Settings and then select Share. Tip! To use Tap and Do, you and the other person both need a Windows 8.1 or Windows 8.1 RT PC with a proximity touchmark on it. This touchmark symbol is often located on the back of your device. Tip! You can also use Tap and Do to invite your friend sitting next to you into a game you are playing or app that you are using. Tip! If the other person does not have the app you are sharing, they will be prompted to get the app from the Windows Store. Microsoft's Windows 8.1 and Windows 8.1 RT offer you an even more secure way of accessing your PC than a traditional password. A Picture Password requires you to draw a combination of shapes over a picture. You can use your finger on a touchscreen or mouse to draw your shapes. Open the Settings charm and select Change PC Settings to tap or click Users. Tip! Keep it simple when you're making up your picture password. Use a simple photo and select shapes that are easy to remember and draw. Tip! A picture password is restricted to three gestures. These gestures must include some combination of circles, straight lines and taps. Remember to keep it simple – it is much easier to tap a person's nose in an image than it is to trace a complex picture of a city skyline. The Start screen gives you faster and easier access to all your favourite documents and apps. The tiles on your screen automatically update so you receive real time information of what's happening in your world. Tip! Touchscreen users can get to Start by swiping in from the right edge of the screen and then tapping Start. Tip! If you're using a mouse, you can access Start by pointing to the lower-left corner and clicking on Start when it appears. A tile is an app or content (e.g. a website, contact or folder) that you can run from your Start screen by Pinning it. Tip! Not all of the apps installed on your PC are Pinned to the Start screen. Tip! Create a tile for the websites and documents you use every day. Tip! To unpin an app from Start, select the app and open its commands. Then select Unpin from Start. Tip! If you unpin an app, it is still installed on your computer. To find it, use the Search charm. Windows gives you the flexibility to drag tiles and arrange them in a way that makes sense to you. For example, you may create a "Work" group for the apps you use to do your job. Tip! A tile's colour and font cannot be changed. Tip! Resizing is not available on all tiles. Tip! This is only available on some tiles. Family Safety lets you keep an eye on your children and monitor how they use the PC to ensure their safety. Tip! Family Safety needs at least one designated parent to hold an administrator account. You can create child's account that have Family Safety functions activated. Tip! Family Safety may not be available if your PC is connected to a domain. Check with your system admin. Tip! You can also assign parental access to another person on Family Safety. This gives that person authority to respond to your child's permission requests and also monitor their PC activities. If your child already has a Microsoft account or email address, you can add their existing account to your Windows 8.1 PC using Family Safety.